Jo Procter in Public Affairs reports that the Senior Profiles from the excellent OnCampus magazine (distributed at Commencement and Reunion) are available on-line. Great stuff. My favorite is on WSO impressario Evan Miller. Evan took on ever-larger projects for the site, including a list of campus student organizations. He also rewrote the campus facebook. His senior year he founded Willipedia, the Williams answer to the Web’s Wikipedia, a free-content encyclopedia written collaboratively by contributors around the world. That’s me! There was a sometimes heated discussion at Willipedia about what belongs in the Campus Controversy section. Evan and I have different views on this topic. It is not clear if the stated policy is actually enforced. If you think that someone involved in the topic you’re writing about would prefer to go unnamed, grant them that courtesy. Mindfulness of others’ identities is necessary for Willipedia to have a strong base of contributors, and we must respect this both in how we write and in what we choose to write about. The great majority of Willipedia topics are innocuous, and writers may cover these to the fullest extent of their knowledge. Other topics, that concern individuals of the Williams community who are likely not to want to be named in them (eg. some Pranks and Campus Controversies), must either be written without naming the names or left to media other than Willipedia. If you, with permission, include another person’s name in a way that other editors may find questionable, note that you had the person’s permission in your edit summary or on the talk page. Perhaps I am naive, but I am pretty sure that Professor Aida Laleian would prefer that this page did not exist. In any event, Willipedia is great stuff. Kudos to Evan for everything he has done over the last 4 years to make Williams a better place. He will be missed. Laura Lim Prescott ’92 needs your vote. How can you resist? Vote Eph! My two Williams interns — or “summer associates”, as we officially describe them so that their resumes will look even better when they apply to Goldman Sachs — have finished up, leaving enough time to while away the rest of August with their girlfriends. Smart fellows, both. Special thanks to Evan Miller ’06 and Diana Davis ’07 for their help in publicizing the position. I hope you make him so much money that he spends all his time counting it and stops blogging about Williams. Alas, the interns were good, but not that good. Maybe next summer! If First Days start today, then it must be raining in Williamstown. Having doubts about the progress of mankind? Consider how much better your medical care is than that received by your fellow Eph, President James Garfield ’56. Three vertebrae, removed from the body of President James A. Garfield, sit on a stretch of blue satin. A red plastic probe running through them marks the path of his assassins bullet, fired on July 2, 1881. The vertebrae form the centerpiece of a new exhibit, commemorating the 125th anniversary of Garfields assassination. The exhibit also features photographs and other images that tell the story of the shooting and its aftermath, in which Garfield lingered on his deathbed for 80 days. Located at the National Museum of Health and Medicine, on the campus of the Walter Reed Army Medical Center, the exhibit opened on July 2 and will close, 80 days later, on Sept. 19. Garfield was waiting at the Baltimore and Potomac Railroad Station in Washington, about to leave for New England, when he was shot twice by the assassin, Charles J. Guiteau. As all good Ephs know, Garfield was on the way to his 25th Williams Reunion. But it wasn’t the bullet that killed him. At the autopsy, it became evident that the bullet had pierced Garfields vertebra but missed his spinal cord. The bullet had not struck any major organs, arteries or veins, and had come to rest in adipose tissue on the left side of the presidents back, just below the pancreas. Dr. Ira Rutkow, a professor of surgery at the University of Medicine and Dentistry of New Jersey and a medical historian, said: Garfield had such a nonlethal wound. In todays world, he would have gone home in a matter or two or three days. In addition to causing sepsis by probing the wound with unsterile hands and instruments, Garfields doctors did him a disservice by strictly limiting his solid food intake, believing that the bullet might have pierced his intestines, said Dr. Rutkow, the author of James A. Garfield, a book in the American Presidents Series. In mid-August, the doctors insisted that Garfield be fed rectally, and he received beef bouillon, egg yolks, milk, whiskey and drops of opium in this manner. They basically starved him to death, said Dr. Rutkow, noting that the president lost over 100 pounds from July to September. Rough. The poorest person in America today receives free medical care which is orders of magnitude better than Garfield’s was. If that isn’t progress than the term has no meaning. The assassins lawyers tried to argue that their client was not guilty by reason of insanity. The defense was unsuccessful, and he was hanged on June 30, 1882. Guiteau himself repeatedly criticized Garfields doctors, suggesting that they were the ones who had killed the president. I just shot him, Guiteau said. Wouldn’t it be great if David Battey’s ’85 senior thesis were on-line? David Battey almost wrote an undergraduate thesis on agricultural policy. The world is probably a better place because he didn’t. Despite some dubious professors, Battey and four fellow political economy majors at Williams College in Massachusetts delved into the subject of youth service during the spring of 1985. The thesis inspired Battey to create the Youth Volunteer Corps of Greater Kansas City and, later, of America. The Kansas City chapter is completing its 20th summer. Battey’s Youth Volunteer Corps can also be found in 22 states and three Canadian cities. About 15,000 youth spent 216,000 hours volunteering with the program last year. The Corps, a nonprofit organization based in Roeland Park, Kan., has become more than a career for Battey. “I always look upon my job as really more of a mission in life,” said the Mission Hills native who now lives in Fairway. Battey and his classmates’ thesis concluded that the government should do more to promote voluntarism in youth. They said a “bottoms-up” approach, or supporting grassroots programs, was better than a bureaucracy. Their project earned an A-minus. Battey earned Williams College’s bicentennial medal in 2000 for putting into practice what he envisioned years ago. During the Corps’ fledgling stages, he said he encountered many people who were skeptical that young people would shoulder time-consuming jobs for no pay. Then, even school-organized community service was unusual. And what will students in POLI-EC be writing about this year? Someone who doesn’t like EphBlog has been removing our link at the Williams College entry in Wikipedia. This has happened before. I did not use to care so much, but I am getting more and more into Wikipedia as time goes by. You can see our discussion here, and my request for clarification on the general policy here. Wikipedia implies fairly strongly that I, as someone closely associated with EphBlog should back off and let the rest of the Wikipedia community decide this. But the deletions do not come from registered users so they strike me as more anti-EphBlog inspired than anything else. Stand tall in the sky, so the whole world sees. If you ain’t sung praise to the mountains yet, you will. Dan Drezner ’90 explains the efficiency of the academy. Occasionally the marginal idea escapes the academy and has an impact, but by and large students just want to graduate, academics just want to be insulated from the real world, and the real world wants to be isolated from loonies who go on about how great Che Guevara was. In this light, the Academy is a very efficient mechanism, creating surplus for all. Indeed. And then EphBlog’s role would be . . .
Marc Lynch has lost his cat. This is a call for help to local, Williamstown-area readers only… last night, we had to bring our cat to stay with someone who lives close by the Williams Inn. He promptly knocked out a screen window and escaped. We’ve spent many hours since then walking the woods and streets around there looking for him, with no luck. If you happen to see a very scared looking, but beautiful, long-haired orange cat walking around Williamstown today, please drop me a line right away – thanks. Perhaps one of our Williamstown readers will be able to help. EphBlog’s #1 fan, Jacob Eisler ’04, notes this Eph reference. Pluto was looking more and more like a goner yesterday as astronomers meeting in Prague continued to debate the definition of a planet. “I think that today can go down as the ‘day we lost Pluto,’ ” said Jay Pasachoff of Williams College in Williamstown, Mass., in an e-mail message from Prague. With two more days before the scheduled vote, there was no guarantee that Pluto would not make a comeback and that the definition of planethood might be rewritten again. Well, “all time” is a long time. Pasachoff is too good an astronomer to think that all the scientific conventions of today will hold for 100 years, much less forever. Once knowledge of other solar systems increases, there will be no avoiding further changes in nomenclature. Ephs of a certain age and comic sensibility can not help thinking of Sports Night whenever the conversation turns to Pluto’s status . . .
How is all the amazing information on Wikipedia built? Piece by piece. Sean Denniston ’87 discovers that Charles Goodell ’48 was a New York Congressman. He mentions it to me and I pass it on to you. That information is added to Wikipedia by someone who (I think) read it on EphBlog. How long before Wikipedia provides a listing of every graduate of Williams, not just the famous ones, along with their current occupation and location? Not as long as you think. Bill Couch’79, a Captain in the Naval Reserves, has been called up and is deployed, starting today, to Djibouti on the Horn of Africa. While we are very grateful Bill is not being sent to downtown Baghdad, he’ll be “just around the naval corner” and getting combat pay. So . . .
As a reminder to my fellow Ephs who, like myself, did not get an 800 on the Verbal SAT, here’s the definition of APOLITICAL. If you think the war is the right thing to do, GREAT. Write George Bush all about it. Don’t write it to the troops. If you think the war is the wrong thing to do, GREAT. Write George Bush all about it. Don’t write it to the troops. If you heard some fantastic dirt about a classmate that is too scandalous for even the National Enquirer to print, please e-mail this information IMMEDIATELY to me and, oh yeah, to the troops! It’s August, so what better way to spend the time than a lengthy navel-study of linking policy (what is acceptable to link to and what is not) on EphBlog. Read more if you care. Spencer house has a welcome letter for the members of Spencer House. Since it’s an image, I can’t paste any text into a convenient blockquote and I’m too lazy to type anything out myself, but you can go and read it — a nice welcome letter, with energy and thought. Considering the directory, the Spencer officers have been doing some work. I don’t see anything similar for Wood, Dodd, or Currier, but perhaps their web sites are in the works. Williams Bennett ’65 is blogging at The Corner. It was said of Churchill that his greatness laid in seeing things how they really were, seeing things in their misery and seeing things in their greatness. The task is the same for us, or should be. Indeed. Read more for Bennett’s take on the Israel/Lebanon conflict. It is, shall we say, different from Professor Marc Lynch’s. Since we’re all about ideological diversity at EphBlog, we highly recommend both. My classmate, Rodney Cunningham ’88, noted that EphBlog never discussed Bennett’s controversial comments on abortion, race and crime. True! Of course, whenever anyone points out something that EphBlog has failed to cover, I invite them to join EphBlog and cover it themselves. But Rodney was too smart to fall for that one. Since bloggers ranging across the political spectrum (from Brad Delong to Ed Morrissey) defended Bennett, there isn’t much for me to add. David H.T. Kane ’58 points out this New York Times article from Wednesday. Early this morning, U.S. News & World Report will send e-mail messages to hundreds of college administrators, giving them an advance peek at the magazine’s annual college ranking. They will find out whether Princeton will be at the top of the list for the seventh straight year, whether Emory can break into the top 15 and where their own university ranks. The administrators must agree to keep the information to themselves until Friday at midnight, when the list goes live on the U.S. News Web site, but the e-mail message gives them a couple of days to prepare a response. How come one of our in-the-know readers didn’t give us the good news ahead of time? EphBlog needs better sources! Many students don’t enjoy being graded, either. The task of grading colleges will fall to the federal government, which gives enough money to universities to demand accountability, and to private groups outside higher education. So true. Perhaps Mike will help me in my efforts to make Williams more open. We could start by putting all syllabi on the web. We could then make public the summary data — not the records for individual students — about incoming students as gathered from the Common Application and of graduates as they leave Williams. You can bet that there would be some interesting patterns. The College did some of this in the context the Diversity Initiatives, but why stop there? EphBlog is more likely to end up hosted at www.williams.edu than Williams is to release this data on a regular basis, no matter how “unreasonable” the former chair of the Economics Department finds that attitude. Perhaps Mike can raise the issue with his co-author Morty and let us know what the deal is . . .
My last neologism was Nigaleian, perhaps it is time for a new one. reuter’d: To be fooled by propaganda masquerading as news. Derived from punk’d and fake Reuters news photographs from the 2006 Israel-Lebanon Conflict. Reuters has admitted the fakery. See here and here for more overviews of the controversy. But what does this have to do with Williams? Good question! It seems to me that Professor Marc Lynch may have been reuter’d. Not supposed to be blogging this weekend. Supposed to be playing with my kids. Pictures like this from Qana, where more than half the victims were children, do not help. Sorry, no more. When my boy wakes up from his nap, and my girl gets back from the coffeeshop, I’m going to hold them for a long, long time. How did Marc interpret this picture? Just the way we all did. An innocent child is dead, killed by Israeli bombs. A father is grief-stricken, holding the lifeless body of his child. A rescue-worker does what little he can in the background. My opinion: too soon to tell whether or not the particular photo that Marc presents to us is “staged” or in any meaningful way “fake,” but I predict that this story is not going away, that for someone, like Marc, interested in the media and the Middle East, it will be one of the most important stories of 2006. I look forward to reading Marc’s observations going forward. I suspect that he would place someone like Richard North — the main writer at EU Referendum — in the same camp as 9/11 Conspiracy Theorists. 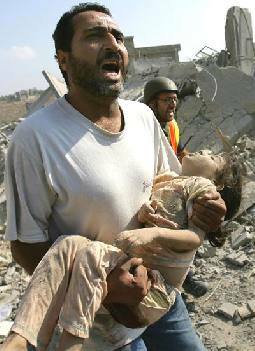 A man screams for help as he carries the body of a dead girl after Israeli air strikes on the southern Lebanese village of Qana 30 July 2006. At least 51 people were killed, many of them children, when Israeli war planes blitzed Qana, the deadliest single strike since the Jewish state unleashed its war on Hezbollah 19 days ago. Maybe I am just an old Zionist, but that description does not strike me as, uh, excessively neutral. See EU Referendum for a different perspective on exactly the same “facts.” If we can’t agree on what really happened in one bombing in one village during a brief war, then the historian’s job is a difficult one indeed. As a follow up to our discussion about how Williams calculates its racial/ethnic statistics, Director of Institutional Research Chris Winters ’95 passes along this link. More than 6.8 million people in the 2000 Census of the United States picked more than one racial or ethnic category in which to place themselves. And 40 percent of them were under the age of 18, suggesting that millions will be arriving on campuses where the standard “pick one box” approach to race and ethnicity may no longer work. On Monday, the U.S. Education Department — following nearly nine years of study and planning — released draft guidance for colleges on how to change the way they collect and report information about students’ race and ethnicity. The system proposed by the department would for the first time allow students to pick multiple boxes, with colleges reporting all of those who checked multiple boxes in a new “two or more races” category. In addition, the new system changes the way data will be gathered about Latino students and divides the “Asian and Pacific Islander” category into two distinct groups. Experts on education statistics generally praised the changes, saying that they reflect the reality that race and ethnicity in the United States do not fit into neat categories. Many predicted that the guidance — if formally adopted, as is expected — would encourage colleges to adopt a similar approach on admissions forms. And several warned that the changes could have important policy ramifications, as the enrollment levels of some groups may appear to decrease. The big question mark for many remains whether these changes will stop the growth in the number of students who refuse to answer questions on race and ethnicity. Read the whole thing. Thanks to Chris for the link. I still hope that Williams will release the raw data from the Common Application. The more informed we and the rest of the Williams community are about the details of who goes to Williams, the better. AOL founder Steve Case ’80 is back. The founder of Revolution LLC is making big promises. He’s done it before. In 2000, as chief executive officer of America Online Inc., Case pitched the acquisition of Time Warner Inc. to his shareholders, saying it would create new ways for people to shop and communicate. Case was wrong. The biggest acquisition in history cost investors more than $100 billion from its 2001 close through July 28, according to data compiled by Bloomberg. That staggering loss hasn’t weakened Case’s stand that the deal was the right thing to do. D’uh! It is surprising to see such a naive Bloomberg article. Case saved the shareholders of AOL billions of dollars by merging with Time Warner. He did exactly what a good, even great, CEO should do. The shareholders of Time Warner were screwed over, but Case isn’t responsible for their welfare. Could this part be true? What is the point of having a billion dollars if you are going to work 16-hour days? I suspect that this is fluff, that Case doesn’t work that hard. He has 5 children! Doesn’t he go to their soccer games and ballet recitals? If not, he ought to learn something from the life of Vince Fuller ’52, as should we all. my favorite blogs, The Barbershop Notebooks. Smith’s posts are here. I am a fan of anyone who likes “Stopping By Woods On A Snowy Evening.” Both my daughters can recite the whole thing by heart. Smith’s thoughts on BiDil are worth reading. A small Massachusetts company recently reported sales of 2.3 dollars in the first quarter of 2006 for BiDil, a new FDA-approved heart failure medication that promises to potentially benefit more than 750,000 Americans currently suffering from heart disease. Yet, the air is tense, the media fans the flame of controversy, and patients are paralyzed, not by the condition from which they suffer, but rather by skepticism and fear. Why? Because the 750,000 people are black Americans. BiDil is FDA approved “for the treatment of heart failure as an adjunct to standard therapy in self-identified black patients to improve survival, to prolong time to hospitalization for heart failure, and to improve patient-reported functional status.” It is the first drug ever approved by FDA to treat heart disease exclusively in black Americans. So, there Kanye, at least one part of George W. Bush’s executive branch appears to care about black people! America has made significant strides in understanding race and ethnicity as social constructs. In 1896, when the Supreme Court legalized segregation in Plessy v. Ferguson, a central question was whether a man who was “seven-eighths” white and “one-eighth” black had the right to sit in the “whites only” section of a train. In 1954, when the high court outlawed segregation in public schools in Brown v. Board of Education, the court chose sociological, rather than biological, understandings of race to support its conclusions. These two landmark decisions demonstrate how significant this debate has been in American history and how it has shaped public policy. Now the advent of race-based medicine may spark a shift backwards towards the accreditation of the biological definition of race. In the process, the free market will run…well…free. Dr. King’s image may be used to communicate the message that We (Big Pharma and black folks) Have Over Come! Snoop Dogg and LeBron James may ink endorsement deals, and Tiger Woods would probably market the Centrum of ethnic medicines, complete for all your ethnicities (but he’ll stay silent when it comes to womens’ health). Some racial minorities may benefit from the advent of race-driven medicine. But at the end of the day where will this development lead America in its discourse on race? Are we well-educated and mature enough to find a balance between biological and sociological constructs of race? Or is there no fair and peaceful balance to be struck? Nice article on Bryan Wrapp ’10. Former Wreckers lacrosse coach John Lake, who was the team’s head coach the past two years, is impressed with Wrapp and feels his former captain, has the total package. In lacrosse, Wrapp was one of the top attackers in the area, leading the Wreckers in scoring with 21 goals and 32 assists for 53 points. Junior year, he was Staples’ leading scorer with 31 goals and 39 assists for 70 points, finishing fourth on the team in goals scored while being its top assist man. The initial spark was struck last summer, after the university announced unexpectedly that it had ended its four-year relationship with the acclaimed architect James Polshek, whose New York-based firm had been hired, amid much fanfare, to design the South Lawn. Word in Charlottesville had it that Polshek’s office — which had won national renown for such widely praised modernist projects as the Clinton Presidential Center in Little Rock and the Rose planetarium at the American Museum of Natural History — had become frustrated by the school’s refusal to approve any design that did not hew to a strict Classical palette of arches and columns. A group of malcontents at the university’s School of Architecture had published an open letter assailing the administration’s effort to turn the campus into a “theme park of nostalgia”: an assemblage of mediocre, slavishly neo-Classical buildings. On the other side, certain members of the board had nightmares of something big and boxy and glassy — something that looked, as one of them put it at the meeting, “industrial” — looming alongside Jefferson’s sacred precinct. The debate had spilled over to the rest of the faculty — and, via Internet newsgroups and blogs, had even drawn in architects around the world. How are people liking the look of the new Paresky Center? EphBlog is powered by WordPress and delivered to you in 1.941 seconds using 29 queries..